I don’t know what it is about persimmons and my family, but we love the sweet things! 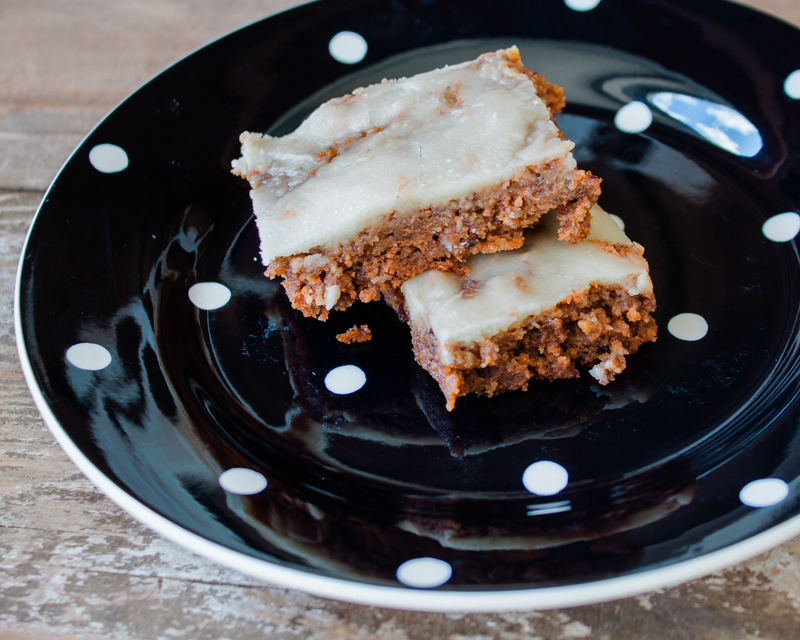 These Lemon Glazed Persimmon Bars are based off of an original recipe from my Grammie. However, this version was created without any of the dairy, refined white sugar or flour. It is always a victory for those of us with food allergies in my family to be able to indulge, once again in one of our favorite Holiday treats! I hope you enjoy these as much as we do! Cheers to happy baking and happy bellies, my friends! Mix and set aside persimmon pulp, lemon juice and soda. Mix all dry ingredients together. In a separate bowl, mix sugar, oil and egg. Add dry ingredients to sugar mixture alternating with persimmon pulp mixture; mix well. Add pecans and dates. Pour into greased and floured jelly roll pan. Bake at 350 degrees for 25 minutes. Make lemon glaze by mixing 1/2 C. Swerve Powdered Sugar Substitute and 2 TBS Freshly Squeezed Lemon Juice together. Set aside. Let cool 5 minutes and spread with Lemon Glaze. Cut into bar sized portions and serve! Enjoy! I just received a box of Persimmons! YAY and Thank You for your Dairy and Gluten Free versions of both the bar and cookie recipe. Absolutely! We know I love persimmons!